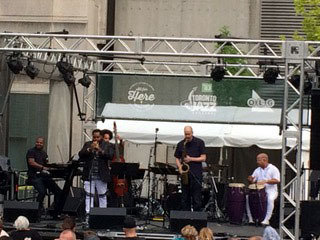 The Toronto Jazz Festival is always a happening event and as with jazz so it seems that the Toronto Jazz Festival does some improvising, changing personnel, adding sponsors, adding acts across a wide spectrum of styles, multiple Grammy award winning Aaron Neville was the headliner for one of the free shows. Changing locations, usually the festival is at Nathan Philips Square near Toronto City Hall, or sometimes in Toronto’s theatre district. 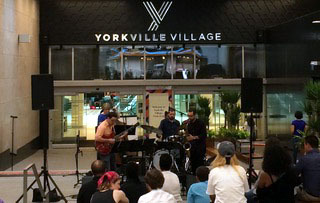 This year’s event, which officially ran from June 23rd to July 2nd had as its base of operations the area located in Toronto known as Yorkville. 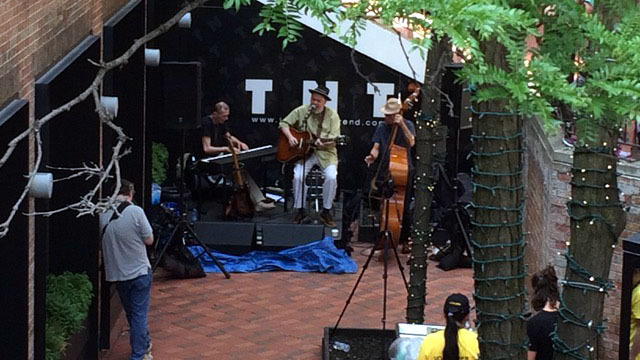 Advertised as having more than 100 free concerts presented throughout stages in the Yorkville community, the shows started daily at noon and ran until about 10 p.m. The Toronto Jazz Festival made use of the newly renovated Concert Hall, formerly the Masonic Temple, Canadian rock legend Randy Bachman kicked off the Concert Hall series on Friday, June 23. His performance was presented by new sponsor, rock radio station Q107. Legendary performers and as many sponsors as possible, these are the major components that keep the Jazz Festivals of the world going strong. No matter your tastes in music or your particular brand of jazz, something to be heard and seen for everyone. There were a couple of major cancellations. Aretha Franklin the “Queen of Soul” was scheduled for July 1st, she cancelled due to poor health and her concert has been rescheduled to June 28, 2018. The jazz trio ACS (Geri Allen, Terri Lyne Carrington, Esperanza Spalding ) cancelled, initially due to illness of one of the members. Later it was announced the great pianist Geri Allen had succumbed to her illness, passing on from this world on June 27th. Geri Allen leaves behind a legacy of incredible performances captured on record and video. I will always remember witnessing the Geri Allen Quartet and the incredibly spiritual performance at that 22nd Toronto Jazz Festival back in 2011. 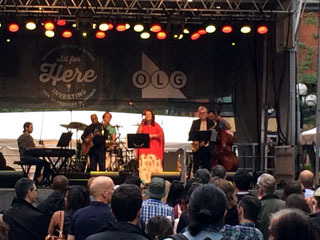 There were a few different venues throughout the Yorkville community, the TNT Lounge, The Laneway, OLG Stage on Cumberland St. , OLG Stage on Hazelton Ave. I visited the festivals stomping grounds on day 6, including the head office at the Intercontinental Hotel. Some of the acts I caught included the Alison Young Quintet. Afternoon jazz in the great outdoors on a sunny day. Alison is a saxophone player with a bright powerful sound. Joining Alison, were a keyboard player, a drummer, a guitarist and a bassist. The group played some straight ahead jazz, some standards and an original tune of Alison Young’s music. Following the sound of music, I headed in that immediate direction down a small laneway and came upon the Brian Blain Trio and heard the Blain hit tune “Saab Story” A romantic ballad about a girl and her car. After that it was time for a break, the beauty of the Yorkville area is it puts you in the vicinity of some of the best restaurants in Toronto. My guest and I walked back towards the festival’s head office and an Italian restaurant I had heard good things about, Fieramosca. The restaurant was excellent, delicious food and wine. The service was great and the place had a wonderful vibe. While dining I happened to notice our neighbours at the next table made up of two thirds of the La Barbera family, brothers John and Joe. I wished them well on their gig celebrating Buddy Rich at 100. The John La Barbera Big Band would perform the music of Buddy Rich at the Concert Hall. Brother Pat would be in the band on saxophone as he was when he played in the Buddy Rich band. John La Barbera contributed compositions and arrangements to Buddy Rich’s band from 1969 up to Rich’s passing in 1989. Brother Joe would play the part of Buddy Rich, big shoes to fill but I’m sure he did a splendid job. As the sun was setting my friend and I headed back towards the festival stages. The first group we came upon, Ashley Summers Raison d’Être, performing on the Laneway Stage. A quartet made up of Daniel Bruce, guitar, Chris Baker, drums, tenor saxophonist Dustin Laurenzi and the leader on acoustic bass. They had a great sound and were playing some of the songs from Ashley Summers current CD – True North. A swinging, flowing feeling emanates from the band, blending arrangements for guitar and saxophone with brilliance. The drums and bass in complete simpatico a delightful jazz quartet. Not long after the Ashley Summers quartet finished the group Sambacana prepared to take over at one of the outdoor stages. This was a party band, and a party atmosphere reminding me of festival time in Brasil. The show got off to a late start, held up by a delivery truck that manoeuvred its way through crowds and barriers to drop off a giant construction refuse container. A different kind of entertainment, something a festival could only encounter when taking over the constantly evolving Yorkville Village. Sambacana with special guest Babi Mendes from São Paulo and made up of Filó Machado, Tico Souza, Alan Hetherington, Ross MacIntyre and Alex Dean. The band samba’d through their set with some hip shaking tunes and Bossa Nova rhythms. After a few tunes of delight from the Sambacana crew it was time for a trip to Cuba with Alexis Baro and Pueblo Nuevo Jazz Project with Jeff King, Papiosco, Amhed Mitchell, Michael Shand and Yoser Rodriguez. Outstanding playing all around for these jazz all stars. Some tremendous trumpet and saxophone playing from Baro and King respectively. A great way to end a day, relaxing in Yorkville and listening to the sumptuous sounds of Alexis Baro and his Pueblo Nuevo Jazz Project. 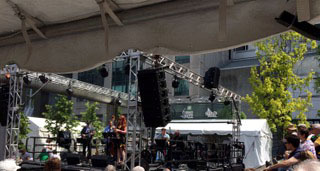 Thanks TD Toronto Jazz Festival for an all around great day.